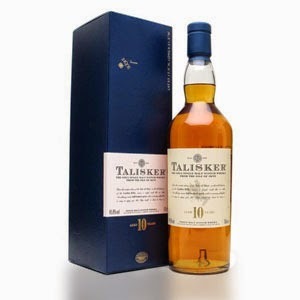 If Vikings would have had a favorite whisky, I think it would have been Talisker. The great mixture of a salty sea breeze, peat and dirt. The smell in this 10 year old is peaty with hints of barley and fresh fruit. Apples and pears. The taste is very vibrant. I imagine standing in the front of the boat with the wind in my hair and beard. The alcohol and peat together makes it fierce, but not in the bad way. Some dark berries comes to mind, and the finish is a bit spicy with hints of black pepper. It stays a while in the mouth and leaves you with an impression of a full bodied and competent whisky. This is a permanent whisky in my collection. Great value for a whisky often on sale. I will rate this 86/100 (21/22/21/22).